The hexagram. It’s a beautiful symbol of balance used extensively around the world and in everyday life. The hexagram might be said to represent the ALL THAT IS and because of its internal symmetry, it represents the ALL THAT IS in perfect harmonious balance – pure perfection. It is a symbol of perfection but it suggests too that perfection or harmony is something very delicate, immensely fragile, and it is easily lost. It is something that must be purposely sought for. It is the symbol of the Sun and, it is the symbol of the Son holding Tiphareth at its very center. It has a golden heart. The hexagram signifies the Great Work of Alchemy. It signifies the emanated and the source. It is the ALL and its creation or reality. 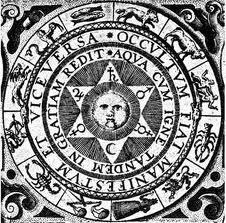 As the symbol of the Sun it emphasizes this idea that all originated from the Sun or central point and all will eventually come back to the central Sun. The Hexagram represents the polar opposites that we must reconcile back to the single point. It is the six days of work using polarity and the seventh day of rest in which those polarities are reconciled. The Hexagram can be used to reconcile many occult systems and in doing so it is a key to showing that each system is designed consistently and with a similar purpose. They each show us how to achieve the Great Work of alchemy. The Hexagram shows in multiple different ways that we were created to create. It also shows us that in our current state we are unable to create perfection as we should because we are unbalanced and out of harmony. A study of the hexagram brings many thoughts and contemplations. I spent several years obsessing on this symbol and then, together with SC Vincent, wrote The Mystical Hexagram: The Seven Inner Stars of Power from which the above italicized quotes are taken. The book is available from Darura Press, Amazon and from me. You may also like the promotional video posted below….